PADMA Lakshmiai??i? ?s memoir, Love, Loss, and What We Ate abounds with poignant passages ai??i?? of her childhood, and especially, her grandmotherai??i? ?s kitchen in South India. The most arousing segments yet are in recollections of her romance with Salman Rushdie. They fell in love over the telephone, recounts the model and reality food TV star. As she puts it, the Booker Prize-winning British novelist seduced her with his one weapon of choice ai??i?? words. In an email interview, Lakshmi spoke about going from being a muse, to a writer in her own right. What makes a good food writer? Is it important to be a good cook to be a good critic? The single most important thing you need to have to be a good food writer is a love of food. Anyone can do it as long as you appreciate eating food and savour the experience, all you have to do is describe what food means to you, how it makes you feel, and what the experience of enjoying it is really like. In the literary and art worlds, weai??i? ?re familiar with muses and creators. But rarely do we find the muse turning the tables, so to speak. Forgive us for being cheeky, but do you believe you can now claim to be as much of a literary critic, as Rushdie can ever hope to be a connoisseur of food? The book was a big milestone in my own writing life, a departure from the books I had published in years past. It was hugely gratifying to write the history of all the women I loved, who raised me and made me who I am. That, and the parts about my career and motherhood, are to me what will stand the test of time. This book was written for the next generation of young Indian women all over the world, and to receive positive feedback travelling through India has been moving and humbling. Weai??i? ?re looking at recipes such as the ones for “yougurtAi??riceai?? ?, ai???Krishnaai??i? ?s pickled peppersai??? and ai???kichidiai??? in the book, and trying to find some context. How important it isAi? ?today, to package ourselves suitably? These recipes are personal and important in the context of my story. Moreover, writing this book is in a way drawing a line in the sand saying, I donai??i? ?t have to package myself at all. I am a product of all of my experiences. Weai??i? ?re keen on having your views on an evolving Indian global identity. Itai??i? ?s wonderful to see different interpretations of what it means to be Indian in the new age. Social media has had a big impact. Iai??i? ?m happy to see that there are now more Indians like me in the media around the world. Whether itai??i? ?s AR Rahman, or me hosting food programmes, or Indian designers like Naeem Khan and Bibh Mohapatra, as well as amazing writers, we are breaking down stereotypes that have existed for decades before we showed up. How deeply does South Indian culture influence your thoughts,Ai? ?and the way you interact with people in the West? You have to first develop a (level of) comfort with who you are, in all your facets. I am very much a child of Madras (Chennai), and a daughter of a South Indian family. Those aspects are inherent and fundamental to who I am. So I wear them lightly. Iai??i? ?ve stopped trying to be Indian or American. Iai??i? ?ve started to enjoy just being me. Much of the memoir deals with this journey, one that is universal to all of us in some form or another. But from where I stand today, I move freely between the two places Iai??i? ?ve come to call home, both physically and spiritually. Do you believe that fusion culture has, in some way, reached saturation point ai??i?? not just inAi? ?food, but also with music, fashion, and design? The world has just begun to scratch the surface on what true regional Indian home cooking is. I donai??i? ?t think weai??i? ?ve reached a saturation point at all, when it comes to the converging of cultures in anything that includes matters of taste. Most urban middle-class Indians will have Chinese, Mexican, Italian and Thai food, every once in a while. Our tastes are becoming broader every day, and this is a good thing. In a large context too, not just in food. I can speak for American food culture, and I can tell you, there are some exciting renditions of Indian food being done abroad. The human race is more migratory than ever before, and this will only benefit all of us. Tell me how someone eats, and I will tell you who they are. Iai??i? ?m interested in breaking down barriers and showing people how rich, interesting, traditional, and innovative Indian food and culture can truly be. At no time am I worried about a saturation of fusion cooking. If itai??i? ?s done well, itai??i? ?s delicious. In the 1980s, Indian food got a bad rep, as people were doing hideous things like tandoori pizza. But to do a jeera tomato pizza with some fresh, authentic, beautiful mozzarella, would be the right way to blend those cultures. My documentaries and writing have always been about the converging of cultures. All I had to do is look into my daughterai??i? ?s eyes, and that motivated me to write the best book I could. 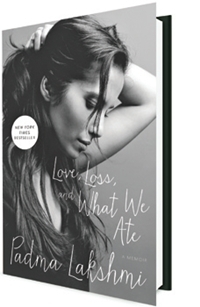 Love, Loss, and What We Ate: A Memoir by Padma Lakshmi, Rs 699, HarperCollins India.